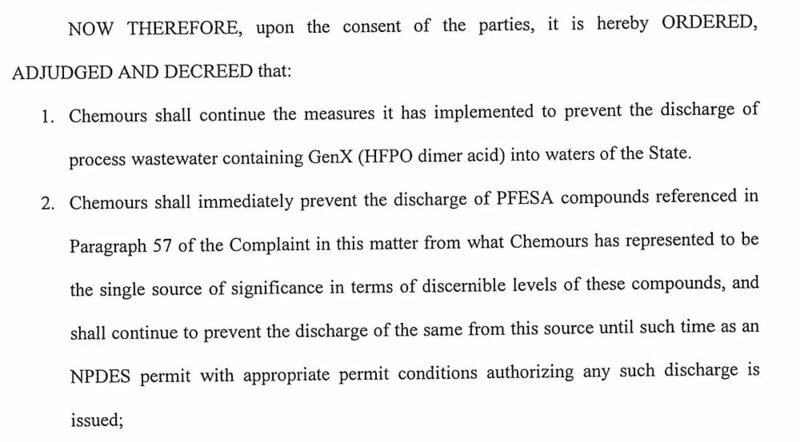 In other words, they agreed to CONTINUE their so-called "good faith effort" to stop discharge of GenX (the wastewater of which also contains a slew of other PFAS compounds) and IMMEDIATELY PREVENT discharge of Nafion byproducts 1 & 2. In light of yesterday's news about HIGH levels of toxins found by EPA - AFTER Chemours agreed in a court of law to immediately stop these discharges - we'd like to remind folks of free water alternative. Below is extracted from the CFPUA website. If you find this service is not providing as described, please let us know. "Residential CFPUA customers may fill their clean personal containers at New Hanover County’s Ogden Park near the tennis courts at 615 Ogden Park Drive from 8:00 a.m. to 8:00 p.m. daily. "For citizens unable to get to the water station at 615 Ogden Park Drive, CFPUA is partnering with the City of Wilmington and area churches to provide free water from Ogden Park. "Churches will transport empty containers to Ogden Park where they will be filled with treated groundwater at no cost. Church volunteers will then bring the filled containers back to the designated churches, where customers can pick them up. Churches will be open for drop off between 9:00 am and 11:00 am every Monday, Wednesday and Friday, and for pick up between 1:00 pm and 3:00 p.m. on the same days. Ephesus SDA Church, 1002 Castle St., (910) 762-7755"